Now I want you all to stop and take a look at the artwork in this title, drawn by Adrian Alphona. Seriously, from the cereal name “GM-O’s” with the tag “trust your gut, not the lawsuits” to the random parking meter with a hatchet stuck in it… it’s all gold. And it’s made even better with the excellent story telling by G. Willow Wilson. 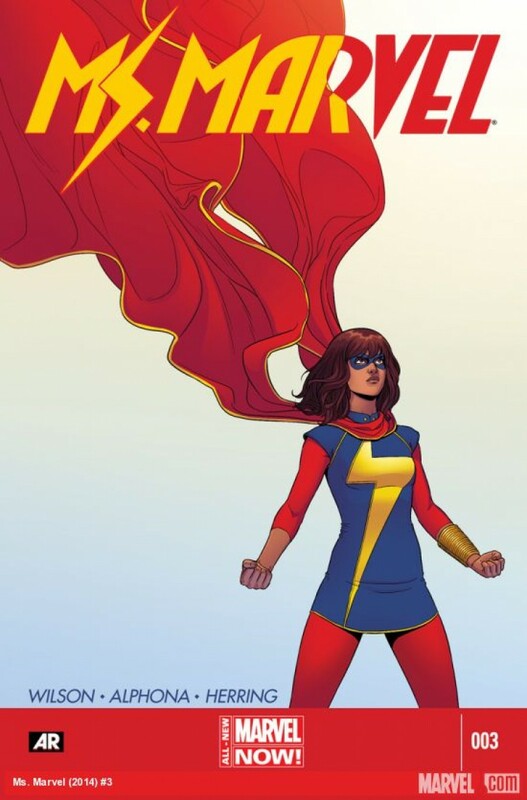 To be honest, the story of Kamala Khan is all one big trope, the kind of stuff we’ve seen in every teen superhero story where the kid gains powers, they’re horribly awkward with them, meaning they accidentally destroy school property, etc… etc… But through Kamala’s eyes, the story is fresh and new, and it’s because she’s a young teenage Muslim girl who is acting like a young teenage Muslim girl. She is not one walking cliche, but she’s not an anti-cliche. She’s perfectly normal and reasonable. She’s charming and funny. She’s relatable and sympathetic. And when she gets shot in the end you’re rather shocked and worried while knowing that you kinda saw it coming. This is what I call perfect storytelling.